The Paraguayan revolt of 1721-1735 was the first of sev-eral events that presaged the Hispanic American Inde-pendence movements of the early nineteenth century. Exist-ing works on the revolt, though, are either too short, superficial, or inaccurate. 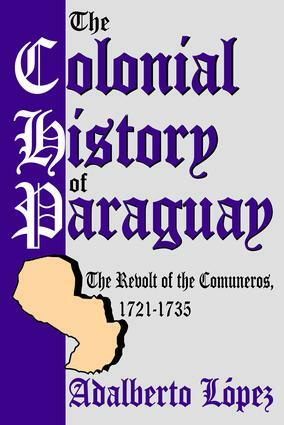 The Colonial History of Paraguay is an original contribution to the scholarship on this crucial period in Paraguay's history. More than a detailed account of the revolt, the work provides an overview of Paraguay in the sixteenth and seventeenth centuries, combining politics, eco-nomics, and social analysis into an integrated whole. It is the first modern study of a little-known yet significant portion of Hispanic-American history.